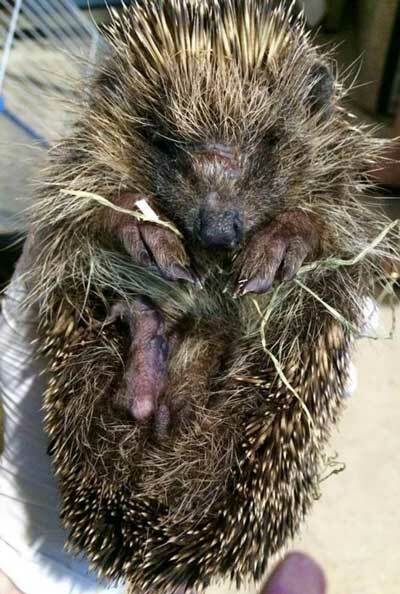 Animal welfare organisations have criticised the treatment of hedgehogs in a research study after one was found looking like "a bad joke". Russet the hedgehog, who later died, had 26 plastic tags attached to his spines and a radio tracker on his back. The British Hedgehog Preservation Society has defended the Nottingham Trent University study, which it part-funded. But three other animal welfare organisations have raised concerns. 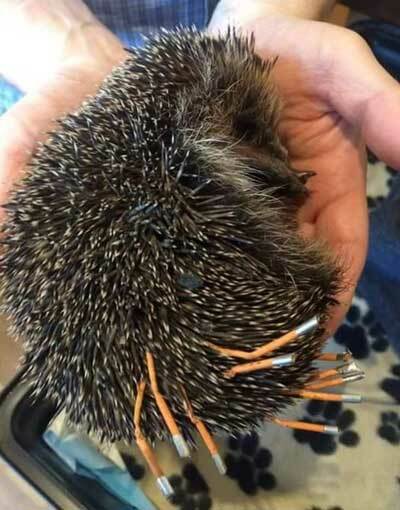 Lynda Britchford from Oxton Wild Hedgehog Rehab, which cared for Russet after he was found, said: "Having been presented with the hog, to be honest it looked like someone's idea of a bad joke. Ultimately, we feel that this places hogs at a disadvantage and risk, and don't agree with it." Russet was dehydrated, underweight, had mange, severe colitis, broken toes on one foot and intestinal fluke, and died despite attempts to treat him. Hedgehogs do not have distinctive markings like other animals so some researchers identify them by heat-shrinking or gluing plastic to their spines. This method has been used since 2004 and has been likened to adding false finger nails or hair extensions to humans. Radio-tracking of hedgehogs began in the 1970s. Trackers have become smaller over time, and international guidelines stipulate they weigh a maximum of 5% of the animal's weight. Caroline Gould from Vale Wildlife Hospital said: "Vale is totally against studies such as this. The tracker is far too big and will almost certainly cause problems, get entangled or prevent the hedgehog from getting through or under hedges, gates, fences and sheds. 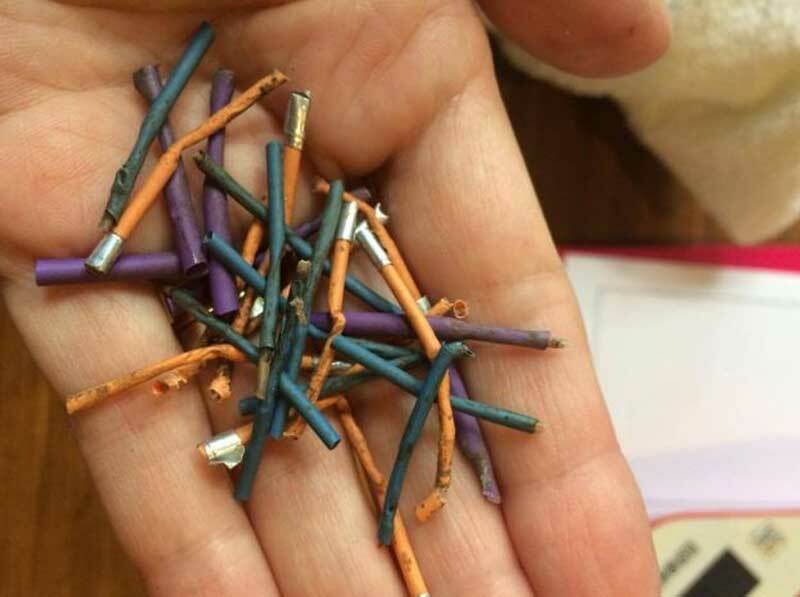 It should not be legal to use these on hedgehogs." 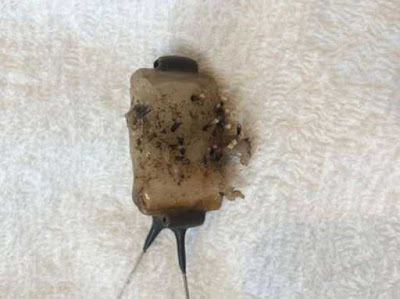 The RSPCA has used plastic tags and radio transmitters itself but said it has "some concerns" about the images of Russet. 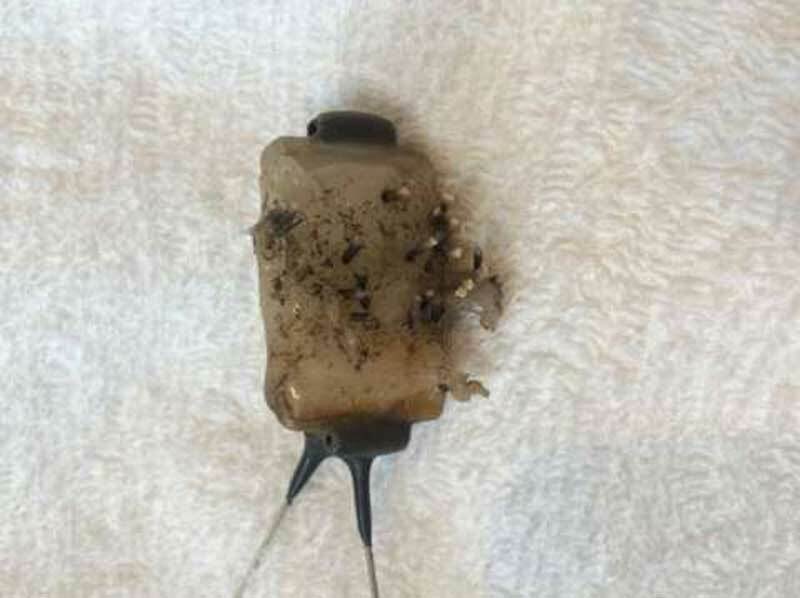 "We feel that the number of coloured tags, and the fact that they are longer than the spines they are attached to, may present problems, although we have no evidence for this," it said in a statement. 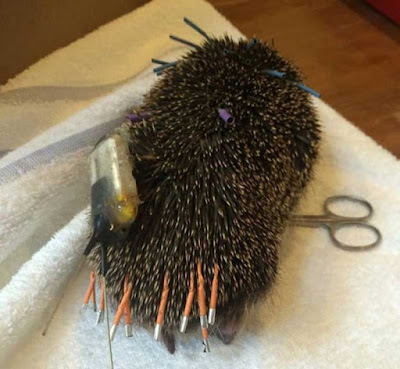 Lynda Britchford from Oxton Wild Hedgehog Rehab said the placement of the trackers "would impact upon males trying to mate with females who had them attached". She also said the attachments would impede a hedgehog's ability to squeeze into small gaps and make them less camouflaged. "Sticking 30 brightly coloured long reflective tubes on them makes them stick out like a sore thumb - particularly to unscrupulous kids or adults, and potentially to predators," she said. Hugh Warwick from the British Hedgehog Preservation Society, which part-funded the study, said: "Over 30 years of work there is no evidence that our research interferes with the well-being of hedgehogs at all. 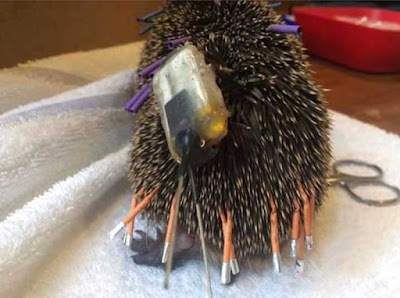 "The heat-shrink plastic tags that are now the standard marking technique do not require plastic to be melted onto the spines and cause the hedgehog no trouble at all. It is not far off humans getting hair-extensions." Nottingham Trent University said: "The animal is completely unhindered and able to go about its activities - such as feeding and breeding - in the usual way. Research is crucial to furthering our understanding of the threats hedgehogs face and to develop appropriate responses to those." The aim of the study was to gather information on the distribution and abundance of hedgehogs in Southwell, Nottinghamshire. The woman who found Russet said the transmitter was twisted around him. "He looked distressed and I think he was a bit wobbly," she said. "We thought either he'd been rolling in wire and got it stuck to him or somebody had thought it was funny to put Christmas tree lights or something around him. When my husband went to get him to pick him up he couldn't curl up, he couldn't curl and protect himself, so that upset us because we thought, there's something wrong there."